Sophie: What do you do for work? Whilst other giants use the 'witching hour' to gobble up people the BFG is doing something nice for them by giving them their dreams instead. And this is how Sophie, who wakes up in the middle night, first spots the BFG, he is blowing a dream into the bedroom window of the children across the street. In both the book and the film the BFG is surrounded by dreams he has bottled and that is the inspiration for this make - to make a dream catcher complete with a dream. But before you reach for a jam jar and fairy lights and given that dreams are both mysterious and magical, why not create your own unique light show to represents your bottled and dream. 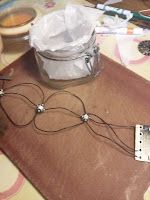 Finally, I have included further references showing how to solder NeoPixels and some sample code too. Find out how to solder NeoPixels here by applying the info from this Ada Fruit mask tutorial. Sample python code to get you started from multiwingspan.